I am blessed to have some super talented friends. The SELF Mission is to assist souls in maximizing their experience on their journey through This Life by releasing and clearing as much interference as their soul/spirit will allow. The soul/spirit of the person (or their inner wisdom) is always the authority on their journey. I respect and ‘assist’ in harmony with that wisdom. S.E.L.F. bringing you back to you. Tammie operates a Labradoodle breeding business with integrity and love. She and I have been friends for years and I truly value who she is. Daina is a Professional Organizer who has have developed systems that are both practical and easy to maintain. She loves nothing more than to share this knowledge so that you can enjoy your space and have more time for the people and things you love. She helps rural women with their businesses and has helped me with opportunities and endless support for my ideas. She also has an amazing sense of humour and makes business fun. Virginia is also a natural intuitive and her insights have helped me with many frustrations. We hosted a popular radio show together and had so much fun while sharing information with our listeners. Lorraine has helped me figure out more than one problem, her connection is clear and she is truly insightful. She is on a mission to help the world understand psychic is Normal. 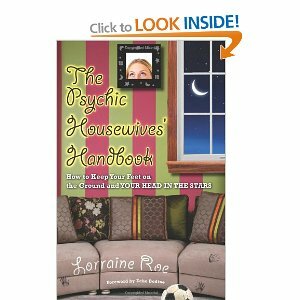 Lorraine runs a very popular group Psychic Housewives and a must read book Psychic Housewives handbook.